Materials Needed For Paper Quilling: Hit the Ground Rolling! 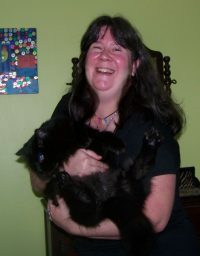 So you are ready to get started learning quilling? Awesome! Lots of adventure awaits…now there’s a variety of materials needed to get good at it….some necessary, some nice, but I will go over them so you can start rolling that paper with the best of them. Better yet, how they all come together explained in detail so you won’t be left hanging. As a disclaimer, I’m like you and in the “exploration” phase of quilling – not jumped in with both feet yet. It is something that I want to learn for sure! Here are all of the “necessary” tools in order of importance – some you will need to get started and others will prove to be helpful upon greater mastery. But First Paper, The Bread and Butter of Quilling! It’s important to have the right kind of paper….You can have any colors you want, but texture is important. It is recommended to look for that with a weight of about 80 gsm. In other words, somewhat lightweight is best. Check out my paper guide if you need a little guidance about stuff like paper weight and thickness! Generally, we aren’t using cardstock here which is a little too stiff to be pliable enough to mold into various shapes. Your needle is the sine qua non of quilling! Two essential tools needed kind of resemble embroidery needles. You should have at least one of these -a typical quilling needle has a nice base (like a small screwdriver) and a slotted end slightly resembling a two-pronged fork. This slot makes it easier to keep a grip on the paper as it is being turned. There is also a needle that doesn’t have the slot – it produces tighter rolls but it’s a little trickier to roll the paper though -but one advantage is that it doesn’t leave a small crimp in the paper as easily as the slotted tool. I haven’t picked up a quilling needle yet, so for the meantime I’m improvising. I inserted an embroidery needle into a wine cork…this will produce nice tight coils. Both tools, irrespective of end tips, have a knurl on the handle that makes rolling easier. But being a beginner like you, I needed a slotted opening, of which I discovered my sewing machine’s spool pin mount works perfectly for this demo due to its slot at the top. OK, not a “professional” tool, but worked well in a pinch! Whether you want to make standalone objects, such as Christmas ornaments – (things like angels or trees; that would be adorable by the way) – or two-dimensional ones such as adornments for handmade cards, glue is going to come into play. I’ve always preferred clear glue to produce no-show…I’m using Aleene’s Tacky Glue which is a great brand and pretty popular. The saying “a little dab will do you” is no truer than with quilling! Literally, you should only use a dab -once for the tail end of the paper when it is curled all the way, to seal off the design, and secondly if you are attaching the designs to something like a card or a background, you’ll want to apply it sparingly at the bottom so it will not show. Template boards are very helpful in that they guide you into getting more accurate shapes from your coils. They are, as their name insinuates, a board – but with various round (or other shape) openings in them of different sizes. Some have also ruler marks on them too. Your workspace….I have a masonite board that makes a great impromptu desk that I can take anywhere. 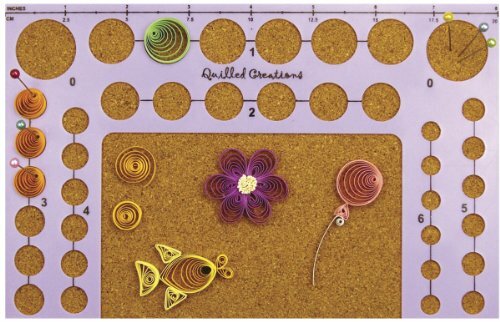 You need a flat surface workspace with which to practice your quilling. 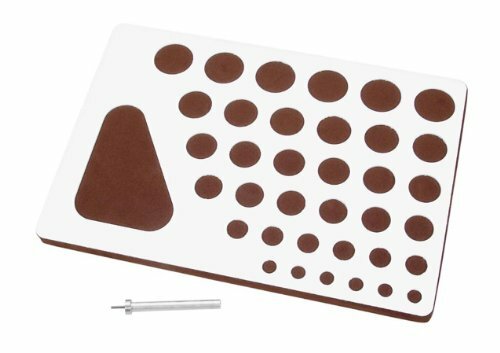 (Not one of those beanbag lapdesk thingys )- needs to be flat as you will be attaching quilled objects parallel to a surface. You should also consider investing in some of the longer length tweezers, as they do work better than the standard size. While tweezers can be helpful in moving coil pieces around after gluing, some straight pins will be a good idea to hold together pieces while drying on your template board. Your best bet is to look for pins with colorful balls on one end as they will show up nicely. 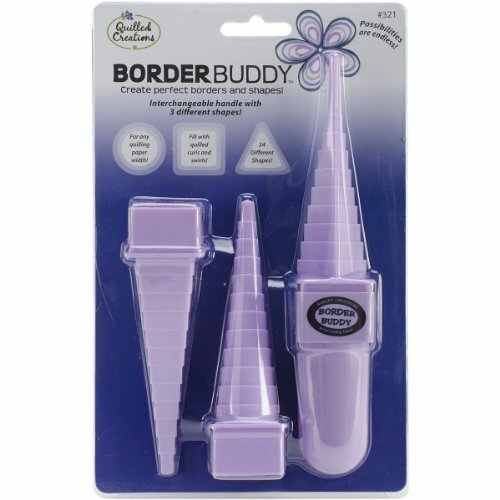 Border buddies are tools that come with different shapes like triangles, squares, etc., and resemble little cones. They enable you to make transitions from tighter coils to looser with their graduated design. Shaping buddies are great to use when you want to produce less tightly compact coiled designs alongside the ones that are more compact to achieve interesting results. You can glue the first loop around while the strip of paper is placed on the cone and continue wrapping around until you get to the end. Hope this laundry list will be helpful in your quilling adventures!